As our new Bitbucket space station administrator, you need to be organized. When you make files for your space station, you’ll want to keep them in one place and shareable with your fellow crew members, no matter where they are in the universe. 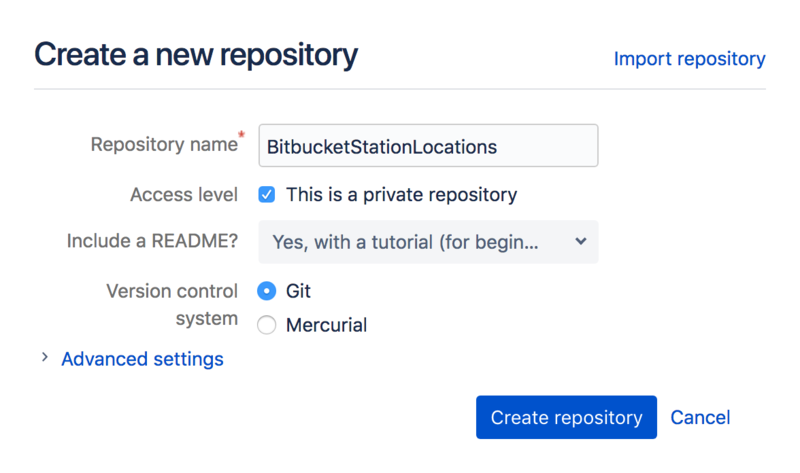 With Bitbucket, that means adding everything to a repository. Let’s create one! Each repository belongs to a user account or a workspace <add link to workspace doc>. In the case of a user account, that user owns the repository. In the case of a workspace, that workspace owns it. The repository owner is the only person who can delete the repository. If the repository belongs to a workspace, an admin can delete the repository. From Bitbucket, click the + icon in the global sidebar and select Repository. Bitbucket displays the Create a new repository page. Take some time to review the dialog's contents. With the exception of the Repository type, everything you enter on this page you can later change. Enter BitbucketStationLocations for the Name field. Bitbucket uses this Name in the URL of the repository. For example, if the user the_best has a repository called awesome_repo, the URL for that repository would be https://bitbucket.org/the_best/awesome_repo. Take some time to explore the repository you have just created. To view the shortcuts available, press Shift and the ? key on your keyboard.